This article is about ethnic Persian scientists and scholars of the pre-modern era. For scientists from the modern Iran, see List of contemporary Iranian scientists, scholars, and engineers. 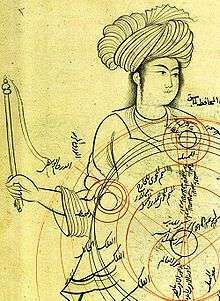 Photo taken from medieval manuscript by Qotbeddin Shirazi. The image depicts an epicyclic planetary model. The following is a non-comprehensive list of Persian scientists and engineers who lived from antiquity up until the beginning of the modern age. Majid Hassanizadeh (born 1952), professor of hydrogeology, theories of porous media (Utrecht University, The Netherlands). ↑ "Introduction to Astronomy, Containing the Eight Divided Books of Abu Ma'shar Abalachus". World Digital Library. 1506. Retrieved 2013-07-15.